The silver-breasted broadbill (Serilophus lunatus) belongs to the family of broadbills, Eurylaimidae. The silver-breasted broadbill species are distributed in China, Myanmar, Thailand, Vietnam, Laos, Malaysia and Indonesia. These broadbill species are vagrant visitors to India and Bangladesh. These broadbills are polytypic species. The silver-breasted broadbill (Serilophus lunatus) is a medium-sized broadbill, measuring 16-17 cm in length and weighing 25 to 35 grams. The male silver-breasted broadbill has pale rusty colored head. The forehead is ashy gray. There are dark rusty lores. There is a broad black supercilium over the eye. The rump and upper wing coverts are reddish brown. The flight feathers are blue and black. The hinder neck is buff. The underparts of the silver-breasted broadbill are white and the breast region is silvery. The tail is black and the undertail is graduated and whitish. The bill is silvery blue with orange feathers surrounding the base. The irises are dark brown. The feet are grayish yellow. The female have a thin silvery band across the breast. The juveniles resemble adults and have darker plumage. The tail and wings are short. The silver-breasted broadbill call is a a soft “ki-uu” or “pee-uu" sound. The silver-breasted broadbill species are distributed in China, Myanmar, Thailand, Vietnam, Laos, Malaysia and Indonesia. Vagrant birds have been observed in India. The silver-breasted broadbill nominate subspecies S. l. lunatus is distributed in south and southeast Myanmar and northwest Thailand. The subspecies S. l. intensus is distributed in Sumatra (Indonesia). 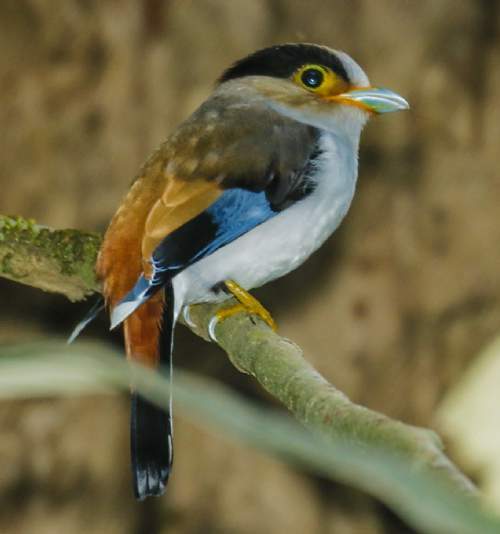 The silver-breasted broadbill subspecies S. l. rothschildi is distributed in extreme south Thailand and peninsular Malaysia. The subspecies S. l. impavidus is distributed in southern Laos (Bolaven Plateau). 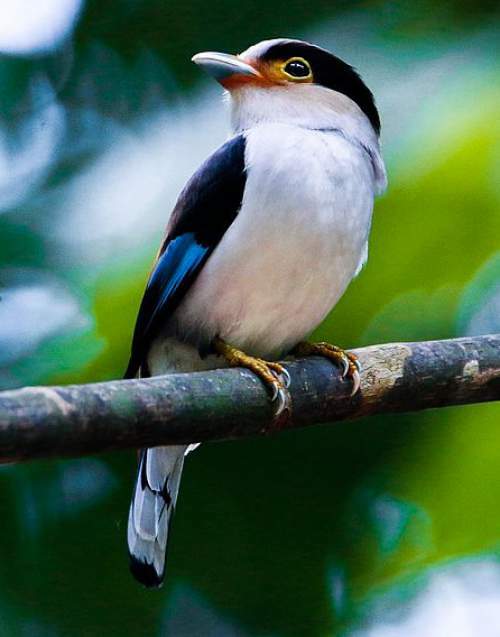 The silver-breasted broadbill subspecies S. l. aphobus is distributed in Cambodia and southeastern Thailand. The subspecies S. l. stolidus is distributed in southwest and south Thailand and south Myanmar. The silver-breasted broadbill subspecies S. l. atrestus is distributed in central and east Myanmar, northeast Thailand, central and south Laos, northwest Vietnam and south China (Yunnan). The subspecies S. l. polionotus is distributed in Hainan (China). The subspecies S. l. elisabethae is distributed in distributed in southeast China and north and central Vietnam. These silver-breasted broadbill species have moderate forest dependence. These species normally occur in altitudes from 300 to 2000 meters. The artificial ecosystems of these species include agricultural fields and rural gardens. 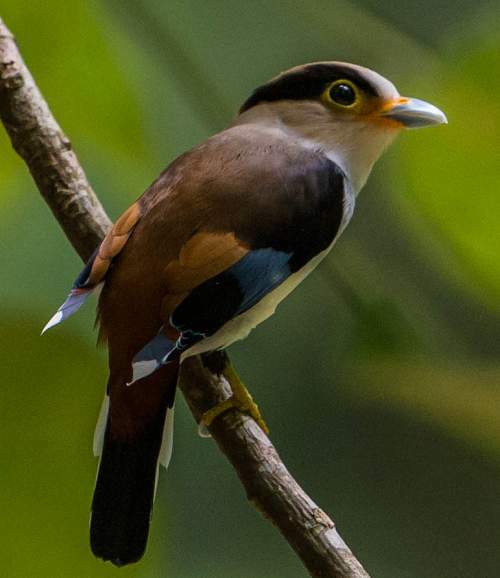 The natural ecosystems of these broadbill species include tropical and subtropical moist lowland forests, evergreen forests, tropical and subtropical moist montane forests, semi-evergreen forests, bamboo forests and deciduous forests. The diet of the silver-breasted broadbill consists mainly of insects. A variety of invertebrates like insects and their larvae, grasshoppers, mantises, caterpillars and small land snails are their primary food. They hawk the flying insects from air and also glean the prey from the tree branches. The breeding season of the silver-breasted broadbill species is from March to August. These birds are monogamous. The nest is hung from the tip of a tree branch with an average height of two meters above the ground. The silver-breasted broadbill nest is a bulky untidy ball of twigs with a lateral entrance. Both the pair take part in nest construction. The clutch contains 3 to 5, glossy, white, oval shaped eggs. The eggs are laid with a interval of one day. The silver-breasted broadbill chicks hatch out after 15 days. The hatchlings are strongly altricial and helpless, being blind and having naked body. Both the parents incubate the eggs and care for the young. The silver-breasted broadbill species are non-migratory resident birds. Birds in higher elevations may move to lower levels and plains in winter. Post breeding, the juvenile broadbills may disperse and establish in new locations within the range. They may make local movements for feeding and breeding within their range. The global population size of the silver-breasted broadbill (Serilophus lunatus) has not been quantified. The overall population trend of these species is reported to be decreasing. Throughout its range this broadbill species is reported to be locally common to uncommon. The generation length is 4.2 years. Its distribution size is about 4,060,000 sq.km. Deforestation, habitat degradation and fragmentation and capture of adults and juveniles for pet trade are the main threats that may endanger the survival of these broadbill species. The silver-breasted broadbill (Serilophus lunatus) does not approach the thresholds for being Vulnerable, either under the range size criterion, or under the population trend criterion or under the population size criterion. The IUCN (International Union for Conservation of Nature) has categorized and evaluated the broadbill species and has listed it as of "Least Concern". The CITES (Convention on International Trade in Endangered Species of Wild Fauna and Flora) status is ‘Not Evaluated’ for silver-breasted broadbill (Serilophus lunatus). The nine recognized subspecies of the silver-breasted broadbill (Serilophus lunatus) are: S. l. lunatus (Gould, 1834), S. l. atrestus Deignan, 1948, S. l. intensus Robinson & Kloss, 1916, S. l. elisabethae La Touche, 1921, S. l. rothschildi E. J. O. Hartert & Butler, 1898, S. l. polionotus Rothschild, 1903, S. l. impavidus Deignan, 1948, S. l. stolidus Robinson & Kloss, 1919, S. l. aphobus Deignan, 1948 and S. l. impavidus Deignan, 1948. Current topic in Birds of India: Silver-breasted broadbill - Serilophus lunatus.